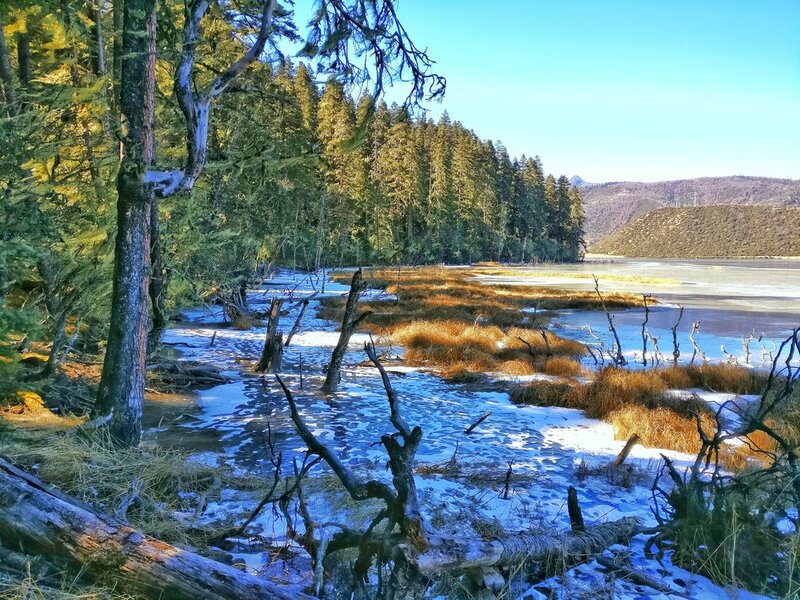 The Shudu Lake at the Potatso National Park in Yunnan. The Potatso or Pudacoa National Park In China was the first National Park of China and opened to public just 10 years back. Situated at an altitude of an average 3400 m the Park contains dense forests, Lakes and Wetlands. Its also a part of the Three Parallel Rivers of Yunnan Protected Area World Heritage Site. Truly well deserved for one of the most bio diverse areas in the World. The Park contains 20% of all the flora found in China as well as one fifth of all the animal species. The primeval forests on the shore of the Shudu Lake in the Potatso National Park. This park is a part of the UNESCO designated World Heritage Site of the Three Parallel Rivers of Yunnan Protected Area. This Lake itself is situated at an altitude of 3700 m but still has dense woodlands on the banks consisting of Pine, Fir and Beech. And at the time I went there was a constant interplay between the ice, snow and the water along the shoreline. This Park is a great biodiversity hotspot as it sits at the Junction of the Tibetan and Yunnan Plateaus with the Indian tectonic plate. That coupled with the high altitude but a lower latitude create a very unique bio-system. The Park consists of many Lakes, open Pasture lands, wet lands and Marshes besides the rolling hills and the snow covered Peaks. The Park is said to hold 30% of all the Flora and 20 % of all the Fauna species of China. This includes the Brown Bear, Red Panda and even the elusive Snow Leopard some scientists claim. 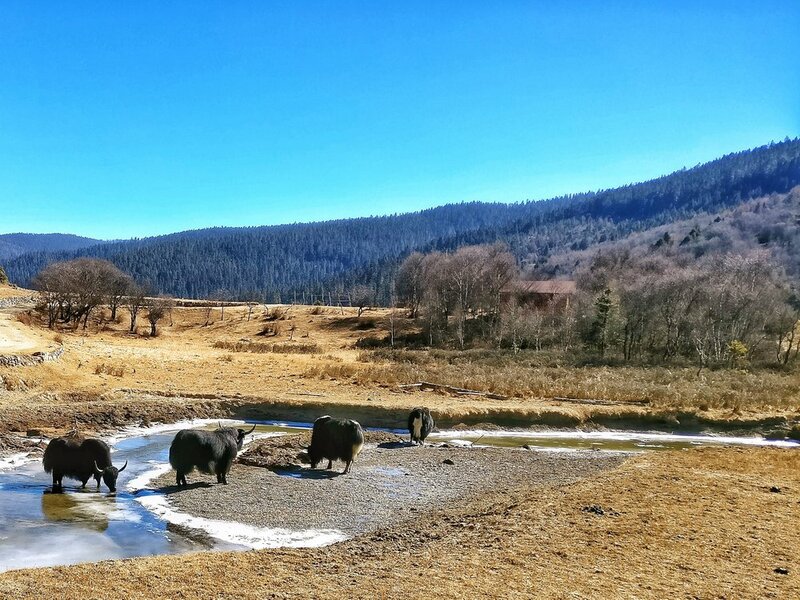 Peacefully grazing by the banks of the semi frozen Shudu Lake at 3700 m amsl in the Potatso National Park as the remnants of the last snow hold onto their last refuges in the shade. This pristine habitat was only opened to visitors around 20 years ago. It is a part of the Three Parallel Rivers of Yunnan Protected Area World Heritage Site. This is one of the most diverse Eco systems in the world with a mixture of flora and fauna unlike anywhere else in the planet. The main reason being that it less at the junction of South Asia, Tibet and South East Asia. Also during the last Ice Age this region didn't ice over giving a bridge for the flora and fauna to move into this region. The bio diversity of this area is simply mind boggling. The Bita Lake or as I just found the Putou Tso Lake in the Potatso National Park. It was only after bit of research that I found out that the Potatso/ Pudacuo National Park, where this lake is located is actually named after the original Tibetan name of the Lake Putuo Tso. Must be the Eastern most Lake with the Tso at the end. Located as it is in one of the world's most bio-deiversity hot spot it offers spectacular views and centuries old forests of Oaks, Spruces and Firs and of course Rhododendrons. It is a primeval place and was opened to Tourists only around 10 years back. It is one of the Core areas of the Three Parallel Rivers of Yunnan Protected Area, a World Heritage site. Mantuluo. Pudacuo is an unearthly world without pollution, far away from the bustle and hustle world. Bita Lake is a fault lake lying in the heart of Pudacuo Park. Being 3 kilometers long and 1 kilometer wide, it exhibits an altitude of 3,530 meters and a biggest depth of 40 meters. Along the sightseeing planked passage ashore, growing are multitudes of centuries-old oak trees, spruces, firs with usneas on. Among the local Tibetans, Bita Lake is said to be incarnated from a piece of mirror of a fairy lady who broke her mirror when combing in the heaven. “Bita” in Tibetan also refers to a place where lots of oak trees are growing. In the centre of the lake, a small wooded island is made the shelter for many rare species of birds. If you are lucky enough to be in the non-windy day, the rosy clouds, the snow-capped mountains and the nearby forests are all mirrored in the lake.